Recorded in Europe in some four hundred surnames spelling forms since the medieval times, this name is a derivative of the pre 7th century German personal name "Heim-ric", meaning "home rule". Compound names of this type, were very popular in the centuries proceeding the introduction of surnames in the 12th century, and this is a good example of the genre. Recorded in such varied spellings as Henrich, Hendrich and Henrick (German), Hendry, Henry and Henryson (English and Scottish), Aimeric, Enric and Henric (French-Provencal), Hendrick, Hendrik, and Hendrickson (Flemish), Jendircke, Gendricke, Jina, and Jindrick (Czech & Slavonic), the Spanish Enriques, and the Hungarian Jendrassik, the name, as a first name, was most popular in England, no less than eight kings being so-called, but as a surname the name is most popular in Northern Europe. In Ireland the surname has two possible derivatives. The first is from the 12th century Norman settlers originally called FitzHenry, the second and most likely, is as an anglicised form of the Gaelic "O'Inneirghe", which has the curious meaning of "The descendant of the abandoned one". 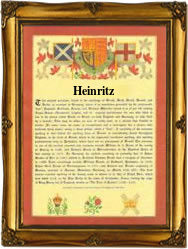 Early examples of the surname recording taken from authentic charters of the period include John Fitz Henrie in the Calender of Inquistions, London, in 1346, Genetiv de Heinrich of Fritzlar, Germany, in 1335, and John Hendrie of Cornwall, England, in the year 1359. The earliest known surname recording from any country is believed to be that of Thomas Henery of Kent, England, in the year 1275. This was during the reign of King Edward 1st, known as "The Hammer of the Scots", 1272 - 1307.